Comparing two brothers to each other is often a lazy endeavor. Both may have similar physical statures and upbringings, but that doesn’t make their abilities on the football field comparable. That is unless you’re a Bosa. If you spliced the highlight reels of Nick and Joey Bosa from their time at Ohio State, you’d be hard-pressed to pick correctly which one made which play without prior knowledge. From a traits, production and skill set perspective, there haven’t been two more similar prospects since we started grading college football. That’s why the younger Bosa looks like the safest prospect in the 2019 NFL Draft class. Size, speed, flexibility, you name it, the two are almost indistinguishable. The combine data does a good job of telling this story on its own. Pretty much all those tests are within the margin of error for any two drills. Mockdraftable.com, which compares the combine testing percentiles across draft classes, claims that Nick’s closest athletic comparison among defensive linemen over the past five years is, in fact, his brother Joey. Neither player possesses elite explosion, but both have absurd flexibility and change of direction for players their size. Both Joey and Nick were head-and-shoulders above their respective draft classes in terms of their college pass-rushing production. While we only have data from 2014 on, the numbers are fairly clear that the Bosa’s are in rarified air over that span. Only Myles Garrett has a higher career pass-rushing grade than Nick’s 93.6 and Joey’s 93.0 while Nick’s 25.5% win rate and Joey’s 21.7% win rate rank first and third, respectively, in our data. The only thing that Nick hasn’t quite proven that Joey had coming out is durability. During Joey’s sophomore season he racked up 928 snaps as he almost never came off the field. In Nick’s career, he’s only managed 1,010 snaps with a season-high of 536 as a sophomore. Joey hasn’t necessarily been a pinnacle of health in the pros though as injuries can oftentimes be unpredictable. This is the one that, while it shouldn’t be too surprising, is still eerie. Joey and Nick have the same moves. The go-to pass-rushing move for each is the side-scissor. A move I highlighted Nick winning against both left and right tackles in his film room breakdown. It’s also a move that is rarely a pass-rusher’s signature, making them all the more identifiable. Both also share the unique ability to win inside, outside and through offensive tackles. They are extremely refined with their hands and never let offensive linemen get into their pads. Because of that, they are equally adept versus both run and pass. That ability, mixed with their size, allows them to line up in a variety of alignments along the defensive line and still get the job done. That type of versatility is growing more valuable by the year at the NFL level. The key takeaway to all this is that we know what all the above translates to. Joey has been one of the most consistent edge defenders in the league since the day he stepped foot on an NFL field. 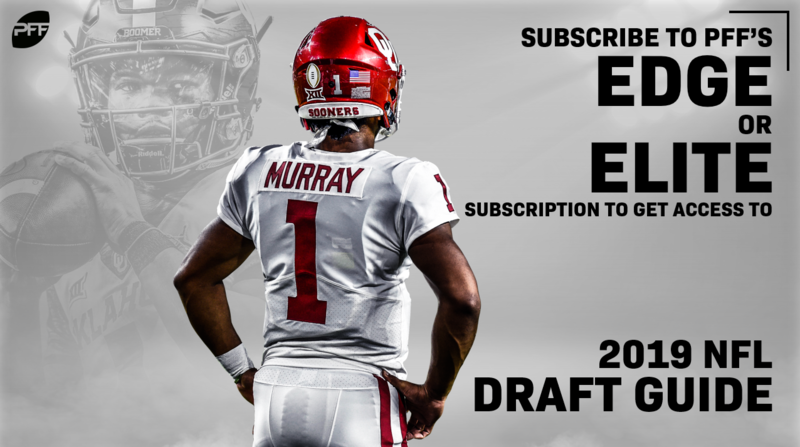 His 90.7 pass-rushing grade the past three seasons is the fifth-best among edge defenders in the NFL and all the players ahead of him were drafted before PFF started collecting college data. 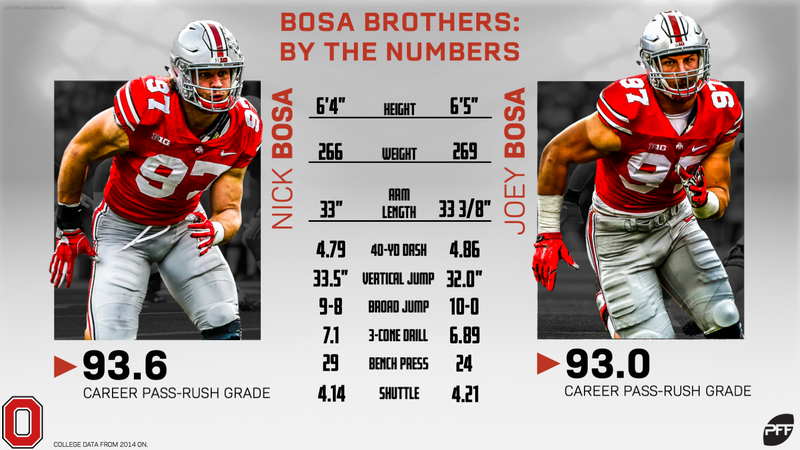 Others may have more tantalizing physical skills or higher perceived ‘upside,’ but the Bosa brothers are going to flat out produce on the football field.